When we hiked the Appalachian Trail back in 2011, I started to experience a good deal of pain in my right hip. The first time I had a problem was in the Mahoosuc Notch in Maine. As we were climbing over, under and around the giant boulders in the Notch, my right hip cramped up and I wasn’t able to put any weight on it. I had never experienced anything like that before but figured it was just a run of the mill muscle cramp. After letting it rest for about twenty minutes, we were able to continue on and make it to our shelter destination for the night. It cramped up several more times in New Hampshire while hiking steep sections. The general ache in my hip continued to get worse over the next few hundred miles. I took several weeks off from the trail in southern Massachusetts and then was able to continue on the trail at a moderate pace. When we hit the Tennessee border, we met up with a group whose company we enjoyed. They were going faster than we were, but we decided to kick it up a notch so we could finish the trail with them. By the time we were getting close to Springer Mountain, my hip was quite sore again. While, I was sad that the adventure was coming to a close, I was very much looking forward to having some rest time for my hip. When we returned home after the trail, the pain in my hip continued, even though I wasn’t exercising. After many visits with the chiropractor and the orthopedic surgeon, as well as several Xrays and an MRI, the answer I got was basically that my body is a mess. I am the proud (not really) recipient of some bad genes from my father’s side of the family. My siblings and I all have (in laymen’s terms) a boatload of bone spurs all over our bodies. Unfortunately, I have one that is right where a key tendon in my right hip attaches to the bone. So, this bone spur irritates the tendon with repetitive motion, such as walking a lot of miles, and I end up an unhappy camper. The result of all of this was that I stopped hiking for some time. I was pretty bummed about this, especially as I watched Beardoh head out for training hikes as he prepared for a thru-hike of the PCT. It wasn’t until almost a year and a half later that things changed for the better. 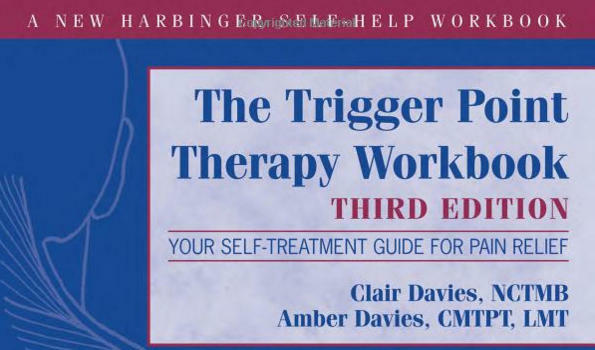 Out of the blue, a friend sent Beardoh a book on Trigger Point Therapy, thinking it might help Beardoh’s asthma. The cover of the Tigger Point Therapy book I have used for the past few years. It was actually a workbook, designed to give you the tools and information to treat yourself. The book kicked around our dining room table for a few weeks before I took a look and got the first glimmer that this might be helpful for my hip. The basic idea of Trigger Point Therapy is that a person’s muscles can develop “knots” through injury or excessive use. These knots can limit the circulation of blood and oxygen and cause pain…either at the site of the knot, or at a referred location. Trigger Point Therapy is almost like a massage (although it can be quite painful at times) as it tries to work out the knots in your muscles. This can be done with your hands, a ball or other specific tools. I have used the ball primarily, as I feel like it gets the deepest. As the knots get worked out, the thought is that the pain subsides. After trying the Trigger Point “exercises” for a few weeks, I started to notice a decline in the ache I would normally feel all day. I was able to start going for short walks and hikes without having any pain. I started to slowly build up the miles and was finally able to get back out on the trail for 15+ mile days. I felt like the freedom of hiking was given back to me. I continue to do the Trigger Point Therapy everyday…whether I am on the trail or at home. Since the summer of 2014, while hiking out west, I have carried a hard rubber ball for doing the Trigger Point Therapy, and would take multiple breaks during the day to “roll out my hip” (our term for it) using a tree or a big rock. On the Arizona Trail in 2015, there weren’t a lot of trees in the southern portion of the state, so often I would make due with a sign post or a gate. I usually do some stretching at the same time to help make sure my muscles are not getting too tight. These exercises helped me to be able to hike long days without more than the normal aches and pains of thru-hiking. We had purchased the ball on Amazon -it is advertised for using on the bottoms of your feet, but it works great for Trigger Point Therapy. 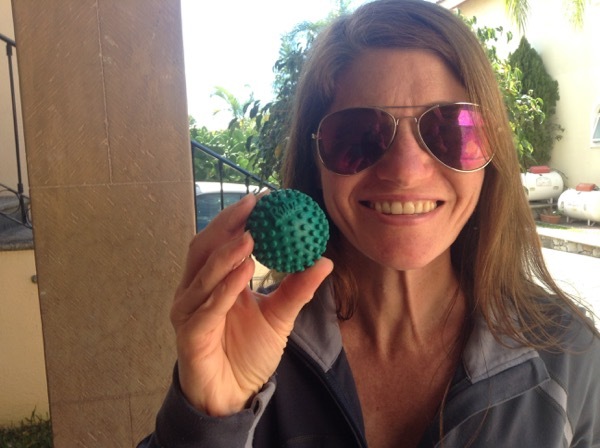 Here is the link –Rubz Massage Ball . Some people use a lacrosse ball, but that is bigger and heavier, so the Rubz ball seemed to be a good compromise. My Trigger Point ball goes with me now on all hikes. I’m sure I get some strange looks on the trail when I am rolling out my hip, as I often look like I am getting a little too friendly with the tree or rock, but really, I don’t care. If that is what it takes for me to be able to get out on the trails and hike with Beardoh, it is a very small price to pay. Beardoh even gets in on the action…sometimes using the ball to roll out his back and some spots on his hips. Sometimes the area around his shoulder blades get sore, and the Trigger Point ball relieves that ache for him as well. TPT is releasing ‘stiff knots’, thus returning control to spasmed muscles. Worked for my spine ( I had kind of a severe Myofascial syndrome). After unblocking try ‘MELT method’. It’s a miracle. For example tired and blocked arms for years after melt-ing moves like if you were a ninja for a lifetime, with amazing lightness and unmatched precision like a robot. The main thing in melt-ing is that It Feeds all soured muscles & joints. A must for RA etc. Best massage after long walking days on the trail. Use your rolled Evazote pad for back massage (place it under and along the spine and slip-off the roll to the left than to the right) . For hand/feet You will need much softer ball than for TPT (like a soft porous ball for pet’s play in zoo-shop). It is always interesting to hear how TPT is able to help a variety of chronic ailments. Thanks for the information on the MELT Method. Glad to hear that you have been able to find relief!